Jio’s “Summer Surprise” was banned by TRAI . 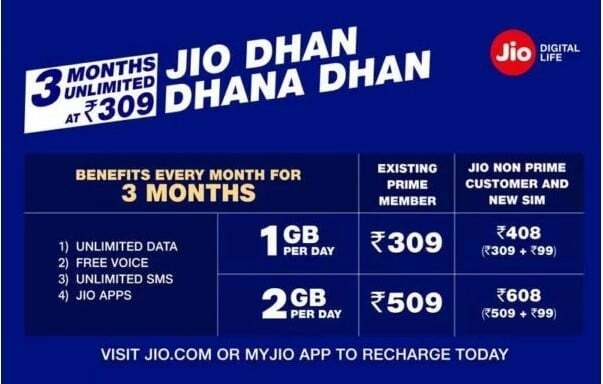 Now JIO Is back with Stunning Offer named as “Dhan Dhana Dhan” scheme. , the company has officially launched 2 new tariff plans and they are sure to create a “Dhamaka” in the market once again. These plans have a validity of 3 months and they are Very attractive. Jio has launched a offer at Rs 309 this is for users who have already registered for the Prime membership. Under this, users will get unlimited voice calls (Local + STD) and unlimited SMS. Along with that, users will be offered 1 GB data per day i.e. 30 GB per month. The validity of this plan is 84 days; this means you will get 84 GB in just Rs 309. Even non-Prime members can avail this offer, but they will have to pay a higher amount i.e. Rs 408 (Rs 309 + Rs 99). If you want to avail 2 GB data per day, you need to choose the Rs 509 plan. This plan also offers unlimited calling and unlimited data for 84 days. Moreover, it will offer 2 GB per day means 60 GB per month and 252 GB for 3 months. Isn’t it a great deal? Non-prime members can enjoy this offer by paying Rs 608 (Rs 509 + Rs 99). The planning is not perfect to understand. I paid 303 already and again I have to pay 309 is something confusing. I am using router. So what about voice call? Is it feexed division or ambani still in a mood to surprise his customer…????? What about people who have already taken Prime membership and done Rs 149.00 recharge? I have recharged with Rs.303/- on 9th April what would be of that. You’re gonna get the 1GB per day for 3 months, don’t worry. People who recharged before paid less (even of it is 6rs difference), no other changes. If we HV recharged 303,Can we get everything unlimited till June last and rs 303 benifits in July?